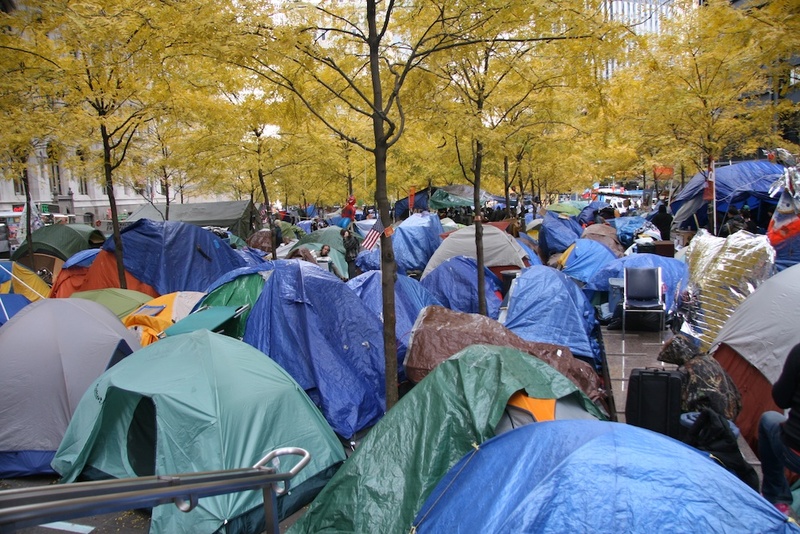 Before Monday morning’s police eviction, Zuccotti Park was choked with tents of all kinds and colors and with all kinds of writing and decoration. There were small one-man tents, dome tents, family sleepers, and military tents — sometimes piled nearly one on top of another. Handmade signs hung everywhere, from the declarative: “Autonomy” to the jaded “Election day sale! Buy one politician, Get one FREE!” to the witty ”20 years ago we had/Steve Jobs/Bob Hope/Johnny Cash/Now we have/No Jobs/No Hope/No Cash”. 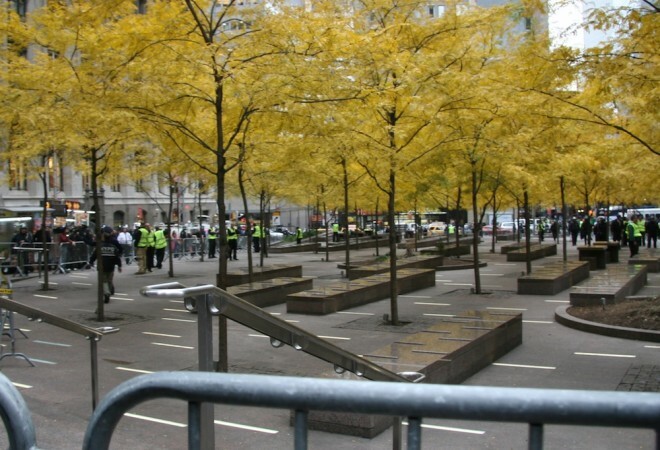 You could barely commute around Zuccotti for how jammed with tents it was, though little walkways, demarcated by tape, were mostly kept clear. It was a little city within the Big City, with its own library, medical center (often staffed by volunteer nurses and doctors), information center, a common kitchen dispensing thousand of meals a day, and even its own tough neighborhood — the West Side. People filled the walkways and sidewalks surrounding the occupation day and night. They ate, chatted, held spontaneous teach-ins and occasionally nasty fights. There was nearly always a chess game going on a dedicated chess table. General Assembly-style meetings, a radical democratic institution focused on consensus, could spring up spontaneously around any kind of group decision or disagreement. Last Saturday evening OWS participant Tim Fitzgerald, a 27-year-old IT worker, stood overlooking the park, facing the west, after a particularly difficult GA that had brought up a lot of the tough social issues around occupation. “It’s not fair that we have to deal with all the problems of the world in this little park, but that’s the task that we’re faced with,” he said, referring to the class divide between the occupiers, many of whom were the indigent, mentally ill, and even sometimes criminals. Their presence in America’s cities has been decried by mayors for decades, and when they’re part of an Occupy, used as the reason for evictions of the encampments, but they are part of the occupation nonetheless. Though often lacking in social skills, the West Siders proved to be the ones with the survival skills and grit to take life in the tent city — they are the full-timers, and many are as committed to political change as the activists. The part-timers, like Fitzgerald, would come in the evening, spend the night once or twice a week (if at all), and often attend a lot of working group meetings and GAs.